It was bound to happen someday and someday soon. Our little Miss Izzy is quite the spitfire, doing the actual kicking and screaming, complete with feet stomping and a scowl. Well, more like a perma-scowl. Well Saturday morning, she was told no for whatever it was at that instance and… enter stopping feet and squealing with anger. This resulted in her very first time out. I know, I know, you think what horrible parents do that to a 15 month old or not our precious Isabella, but it’s true. Daddy put her sitting down in front of the front door and we only had to sit her back down one time. Throughout the whole, very long, excruciating 1.5 minutes, she scowled, cried and flailed her arms. Even after our calm talk that she’s seen us do with Anna, she ran away with that beautiful scowl and ticked. 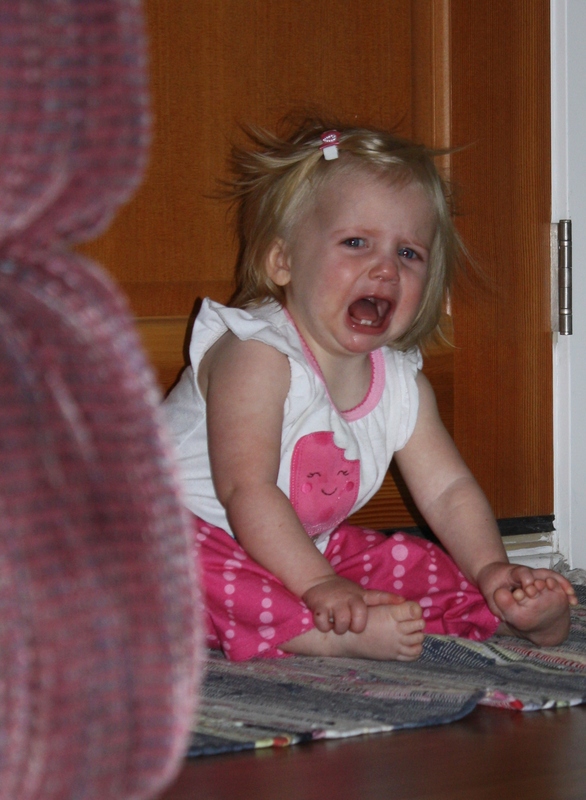 This is the 2nd time out – I know, I’m terrible for taking a picture of her in timeout but it’s too funny not to.